The web is exploding with content and publications about the cloud and technology, which can make it challenging to garner attention for your own blog’s content. Consequently, we created Ideation, a tool that aggregates hundreds of thousands of articles from tech publishers ranging from giant tech blogs, such as TechCrunch, to small cloud startup blogs. All you do is search for a keyword(s) or topic, then Ideation automatically finds and ranks current related articles according to the amount of shares that they receive on social platforms. Ideation is comparable to BuzzSumo, but the big difference is that Ideation is free and is geared towards cloud technology-based content. I asked our talented development team to provide some numbers about the articles that we’ve already aggregated to show you how often tech blogs and sites post and get an idea of how often you should, too. Although Ideation is still in its early beta stages, we’ve already gathered some interesting numbers that you might find useful. As shown in the graph below, we were able to see that in January, 1,076 articles were posted in TechCrunch; 1,502 articles were posted in Forbes’ Technology stream; and 760 articles were posted in Gigaom. >>>> Writer/Blogger? Calling All Tech Bloggers, Writers and Evangelists! The graph below displays how many articles TechCrunch published for the months of December 2014 through February 2015. It is fair to assume that the holidays in December impacted their amount of publications that month and that they tried to catch up and release articles in January that were previously on hold. 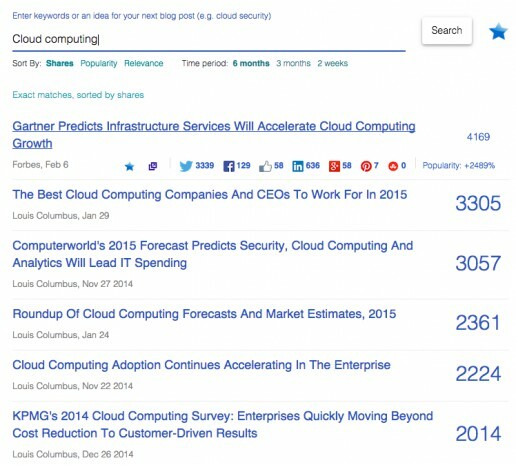 Below, you can see the amount of articles published by tech magazine cloud channels, such as ZDNet’s Cloud topic or CIO’s Cloud Computing stream. Although CIO published more and probably has a lot more traffic than Network World, you can see that the latter invests more into their cloud channel. Publishing frequency, alone, may not be enough to bring traffic to your site, but quantity is an important factor in any content marketing strategy. Understanding the publishing habits of both magazines, peers and competitors can help you determine what your own publishing frequency should be. Information from Ideation can be used to estimate the amount of traffic that sites receive. This can impact how bloggers, marketers, and PR firms choose which sites to approach when they publish their next guest or sponsored articles. So, How Often Should I Post? There is a strong correlation between the volume of content that a site produces and the amount of organic traffic that it generates. We often see that when our clients double their article creation per week, their site’s organic traffic is significantly impacted and can be felt within the range of two to three months. If you are a young startup and your site already brings a couple hundred organic visitors a day, publishing two to three articles per week will most likely double the amount of traffic you can generate in that same time frame. I see sites with thousands of visitors on a daily basis double the amount of their weekly published articles and increase their traffic by 75% in a span of three to six months. Although publishing frequency is an important factor in increasing traffic, it is by no means the only one; the size of your market and your product’s values are crucial factors, as well. Our story doesn’t end here. We can move on to discuss content promotion, distribution methodologies and manipulations, or your allocated marketing budget. However, I’ll pause for now, in hopes that this article provided you with useful insights. >>>>> Tech Writer/Blogger? Calling All Tech Bloggers, Writers and Evangelists! *Disclaimer: Our Ideation tool is currently in its early beta testing stage which may affect the accuracy of the numbers indicated above. Calling All Tech Bloggers, Writers and Evangelists!